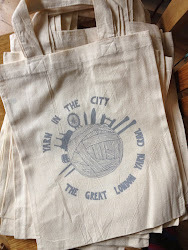 Yarn in the City: The Great London Yarn Crawl: More yarny goodies thanks to loop! More yarny goodies thanks to loop! We owe great thanks to all of the shops participating in the inaugural GLYC - without them, there simply would be no yarn crawling or stash enhancement. Angel's loop, one of the first shops to come on board, is offering a bit more for this year's Crawlers that we'd like to share with you. First off, any and all purchases made at loop on the day of the GLYC will be discounted by 10%. So if you've been craving a sweater's worth of madelinetosh, or are desperate for some Wollmeise, this might be your moment. In addition, loop has donated a hank of Skein Merino Silk Sport in "Opaque" to the after party prize pile. This yarn is a gorgeous blend of 50% Merino/50% silk, 363 yds (332 m)/100 gr. Look at the sheen! "Skein is a small, independent hand-dyed yarn company based in Australia. We love to play with colour and aim to produce unique hand-dyed colourways on high-quality yarns. All of our yarns are kettle dyed using professional acid-based dyes. These dyes are permanently set by the use of a vinegar mordant and heat. Once the dyes have been fully absorbed into the yarn and the kettle water is clear, the yarns are removed, rinsed and washed with a light, phosphate-free wool wash, and then gently spun and hung out to dry under the Australian sun. Our dyes are applied in a way that produces short, random colour repeats which helps to minimise 'pooling' and produces a fabric which is dappled in colour. We offer both variegated and semi-solid colourways." Many thanks to loop for their donation, and who knows - maybe you'll be the lucky winner of this gorgeous skein of silky stuff! Don't forget to go register for your route, and get in on the early bird contest for an original Soakbox! Registration closes at midnight London time on 7th September! Sock yarn glory from Inked Yarns! Early-bird ticket contest: We have a winner! Knitty project bag tags to the rescue! Do you Knit with Attitude?